As we were preparing to fly to Florida for Christmas, a snowstorm hit. It was called The Snowpocalypse by the media, and for many, it kinda was. There were all kinds of historic things about it, and it hit many areas from North Carolina to Massachusetts. It ended up canceling our flight and causing us to wait two days to catch another one. 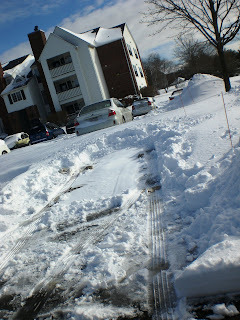 And, unlike our first snow of the season, it was heavy and stuck around for a while. On Saturday, we watched it get going. We went to the store and bought a shovel (actually, we went to two, since the first one was out). 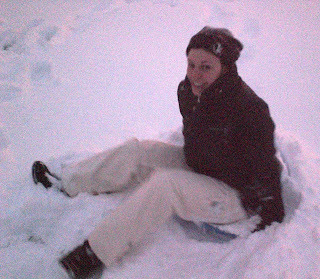 I had gone out the day before and picked up a snow brush and a saucer for sledding). Jonathan got his first taste of driving in active snow, and we hit ice several times on our ten-mile-or-so roundtrip. We came home, learned the fabulous "pull up your windshield wipers" trick, and got dressed to play in the backyard. It was still snowing, so not ideal for playing around. 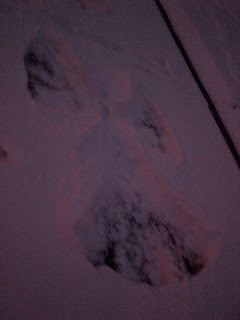 But we couldn't help ourselves as we made snow angels and went down our little hill a few times. I kept getting snow in my eyes, LoL. Daylight was not on our side, so the photos are not the greatest. The next morning it finally stopped. 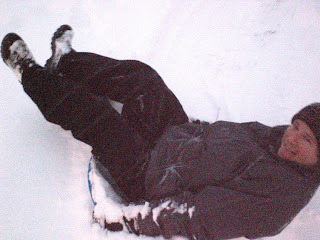 A couple hours after we were already supposed to be in Florida, we decided to go sledding with Rob. We went to Tyler State Park first, but then went down another traffic light to Bucks County Community College. There were a bunch of people on a large hill, so they had already forged a few paths. 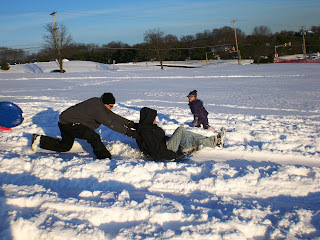 We joined in, but our little saucer was nothing compared to their sleek, swift sleds. Still, we had a good time for an hour or so. We each got to go about five times (it took a while to drag it up again for the next person to have a turn, LoL). I'd definitely recommend the place, and we'll go back there if there's a good time for it in 2010. Of course, we'll also pick up a much better sled, hehe. 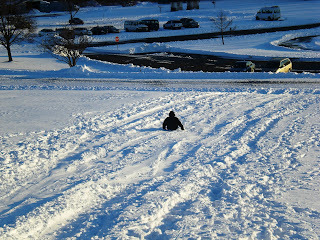 Below are a few photos of the sledding, and one documenting the first time we dug the car out of the snow, haha!